Judd Morrissey during a rehearsal for The Precession. © John Sisson Photography. The Precession, Judd Morrissey and Mark Jeffery’s newest project, redefines literary creation as intertwined acts of writing, composing, and viewing/reading work on the Internet, as well as collaboration and performance. 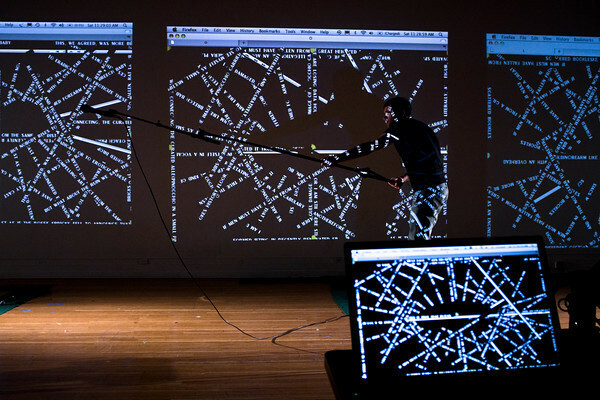 The entire process makes a series of exciting suggestions about how electronic writing in particular can be translated into innovative and significant performances either on your own computer screen, projected into and onto various spaces, or interacted with as a live event. Morrissey and Jeffery use the idea of the website as both a nexus and a prompt for many other community-based activities in the world, continually connecting the experience of navigating language on the Internet to encounters with words and actions in other environments. At an April 2011 talk at the School of the Art Institute of Chicago, Morrissey explained: “We thought of The Precession as a structured fluidity that could be realized at multiple sites and in multiple contexts. Wherever we worked or performed, we integrated the architectural environment, volunteers from the local community, the positions of celestial bodies overhead, and online activity within our vicinity as revealed by geo-coded Twitter feeds.” Their process ultimately exposes a continuum normally perceived as separate modes of media that we enter in various situations in an increasingly electronic world. As a piece of literature, theprecession.org connects the social context of reading on the Internet to the traditional question of how form provides meaning to content. The piece is specifically engineered to use language in very particular ways as a test within/against the context in which it is presented. The multiple elements of the duo’s practice — travel and experience, writing, programming, performance, and documentation (both of experiences and performances) — suggest the act of making art as a powerful analog for action in the world: civic action, exploration, and participation in the world, and the subsequent creation of community. Examined on its own, theprecession.org is a data stream presented in the language of tweets and poetry that continually updates the results of these experiences. It demonstrates that discovery of meaning in the world is a constantly shifting balance between our social context and the personal agency we employ as interpreting it: theprecession.org is a long performance on the Internet that is entered through the small portal of a click that leads to a new window that becomes an endless parallel to our ongoing lives. The element of time that evolves during a reading of this work is particularly effective in evoking a sense of irresistible involvement. The piece becomes self-referential and ironic, evolving and surprising. At its core, theprecession.org is aware of its own context in our current orientation in media, and therefore necessitates a similar awareness on the part of its readers. This is a gesture that places participants precariously, yet precisely, between current and culturally specific positions of consuming information and producing meaning. In “Personism: A Manifesto,” Frank O’Hara talks about the importance of writing with an awareness of available surrounding technologies, and the poem’s social impact. He recounts that “[w]hile I was writing it I was realizing that if wanted to I could use the telephone instead of writing the poem.” A generation later, theprecession.org effectively acts as the telephone writing the poem instead; the act is similarly decisive in its acute awareness of the involvement of even surrounding media technologies in the understanding of any writing. Considered as a poem, the text of theprecession.org implements many basic ideas from the same poetic tradition as O’Hara’s in terms of how form operates in conjunction with content. 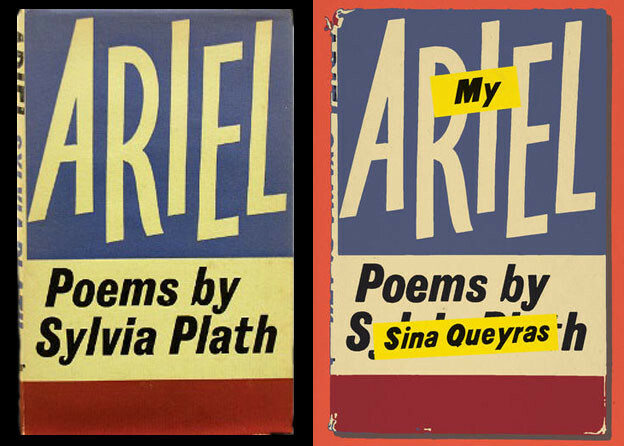 In the twentieth century, O’Hara was vocal about poetry as a practice in reaction to social opportunities to communicate. He exclaimed in “Personism” that as “[i]t puts the poem squarely between the poet and the person … [t]he poem is at last between two persons instead of two pages.” This rendering of the page as transcended by its words suggests a curious irony in the relationship between material conditions of communication and any direct connection between people. We adapt to the increasingly complicated dilemma of more mediation that both promises and threatens our relationships to others. Here, theprecession.org occupies a space that is similarly “squarely between the poet and the person,” but under very (appropriately) different circumstances. Its formal gestures address new contexts of information streaming from screens, from multiple sources to multiple sources, rather than from one voice to several readers who are supposedly eavesdropping on a personal communication rendered in poetic form. Rather, theprecession.org has a different attitude and approach to the personal, seeking to address the individual as a social entity. The precedent for working with context is carried over from O’Hara, but in a new setting, the poetics accompany a different kind of pace, pattern, and placement, elements that primarily challenge our reading habits both visually and cognitively, rather than the idea of any immediate or simply amplified connection with one other person. Rather, the poem seems to reflect the form and language of information as a social material that each of us must determine our relationship to. We may wonder about authorship, or we may accept its example of the power of language that’s perpetuated by its own momentum, kept in motion by a constant urban hum, dropping its detritus at our electronic doorsteps every so often as questionable “communication.” Following this rule, once a group of words attains a kind of critical mass in the chapter “POLI,” it fades until almost out of sight, lingering only enough to maintain a sense that it happened. In order to slowly build up to such moments of catharsis, the first moments of encountering theprecession.org are constructed carefully for an acclimation to the abstract environment of the website. After making a simple initial click, our eyes are directed in constant motion by broad Art Deco striped blocks in basic movements we later learn are inspired from such O’Hara-era political architecture as the embellishments of the Hoover Dam. In a sort of training round, it becomes clear that the eye is obedient and trusting, eager and adept at changing environments and fluctuating rates. Inevitably, these acclimations might change our perception of how time passes around us as we center ourselves in a new normalcy. After all, the website is generative and ongoing. Once inside, we may realize that our point of entry was a curiously unifying start (a chorus of sound bars in a circle flickering like a birth canal coming into focus) for what follows as a very personal and critical experience full of choices (more like conscious life). Therefore, theprecession.org is concerned with the same kind of immediacy and accurate reflection of real-life circumstances that O’Hara was also sure could lead to a paradigm shift in poetry. O’Hara declares, “I confess that it may be the death of literature as we know it.” This kind of flippancy is followed up with the equally hyperbolic and sarcastic, equal parts superior and defeatist statement that personism “is too new, too vital a movement to promise anything.” If as writers our point of focus is split, always, between working within a genre and innovating, theprecession.org provides a necessary precedent that fuses concerns of contemporary poetics for the page as well as for the screen by addressing the basic notion of both as media. So then the page as a site now is not old news, but a new screen. While Morrissey and Jeffery use the languages of popular media to create the poetry in theprecession.org on the platform of web technologies, the piece explores the contours and possibilities of the square space as always capable of manipulation in new ways. When animated, literature on the Internet necessarily references and joins with newer media like television, and it fuses our social faculties, eliciting hybrid and totally new forms of writing and reading; theprecession.org in particular is generative, accurately reflecting how we track our identities on screen perpetually. Such methods offer a new standard for writing in contemporary contexts, whether they are electronic or traditional. The specific use of the Web as a type of theater anticipates the kinds of expectations that readers have in contemporary, popular, interactive, yet mediated forums. The power of the arts to anticipate future social and technological developments, by a generation and more, has long been recognized. In this century, Ezra Pound called the artist ‘the antennae of the race.’ Art as radar acts as ‘an early alarm system,’ as it were, enabling us to discover social and psychic targets in lots of time to prepare to cope with them. This concept contrasts with the popular idea of them as mere self-expression. McLuhan outlines the evolution of media from oral forms to television in order to expose a continuity of cultural needs that media always responds to, for better or for worse. He is famous for insisting that the definition of media is better understood as a tangible medium for cultural information, and that it always influences large populations of people mostly in ways beyond its content. So, most importantly, media creates modes of reception that respond to and mimic the most current technologies and ultimately define demographics and ideologies. the computer user follows the contours of a thought built on computational commands. The system mirrors something called cognition — the abstract rules of supposedly pure unadulterated thought. Or, more precisely, the screen mirrors cognitivism’s pop-comical description of human minds as algorithmic computational code machines. Undoubtedly, this shift to reading material on a computer, not to mention reading literature or experimental poetry on one, or even the idea of reading something on the Internet, adds a new level to how we understand what we are reading. Saper’s point that we adapt our mode of reading, or roving for information, to a modified reception that adjusts its rate to one that the computer directs, adds to McLuhan’s initial observations about our ability to locate patterns in an increasingly mediated world. However, Saper argues that our thoughts become more digital-like, and that our cognition begins to “mirror” how the computer is modeling the world. This suggestion complicates any notion of responsibility that McLuhan had initially suggested for the artist in terms of the form used to mimic media, how the artist might use this form to effectively communicate a message about media itself. Works like theprecession.org that incorporate consciousness of the context of its own writing, and the precise role of the reader, are bound to incite a reader to consider the actual real-time experience with that work. Poetry, in contrast to regular everyday media, has always had the reputation of using language in a way that deviates from common usage in order to provide critical perspectives for society. In his introduction to The Politics of Poetic Form, Charles Bernstein claims that “the formal dynamics of a poem shape its ideology; more specifically, … radically innovative poetic styles can have political meanings.” Poetry always acts as media, and has the potential to be the kind of meta-media that McLuhan asked for: a heightened practice whose consciously constructed form might convey stronger messages than its content. McLuhan insists that the artist is the key to, and must focus on providing, the necessary insight for people surrounded by and actively using media. Similarly, Charles Bernstein insists that “[p]oetry remains an unrivaled arena for social research into the (re)constitution of the public and the (re)construction of discourse.” The best new poetry often comments ironically on the multiple genres (social, economic, political and literary) that produce the contemporary context of the act of writing. These projects tend to sample language from media and test it out as poetry, asking readers to adopt a dual awareness that highlights its reception, and therefore heightens the impact of the content. Morrissey and Jeffery’s theprecession.org, and the chapter “POLI” in particular, engage this vein of interaction based on the particular qualities of our reception of language. Certain modes that constitute our shared approach to the centers of language are met with a form in the piece. And, each element of the piece remains unique, like a person among people in the space of society. Images from theprecession.org are projected onto the Hyde Park Art Center during a performance in March 2011. © John Sisson Photography. A new window opens. Like a cover, a circle of sound files appear to create the circle over and over at an increasing rate. Snippets of archived files are translated by a computer voice program into parts of phrases and words. We are surrounded by fragments, continually translated from other realms and times. Diorite. Rock. Origins of the word from the early nineteenth century. Bars containing sound files disappear and are replaced by a circle of sentences that extend like rays from a center, based on the original formation of the sounds. We are leaving the area of the aural and entering the timeframe of the book. The center shifts and the circle moves around the page. A little time later, two figures appear like hieroglyphs surrounding angular fonts that resemble bricks. A line appears every so often and then disappears. As I write, I see the book shifting behind the page. As I stop my own writing to check in on the state of the site, letters are being offered up onto a screen. They form into circles of their own accord, owing to an ever present center of gravity. “Bricks fell to announce that they had fallen.” In some sort of post-literary world, when “literary” is only defined by the book, action exists to cause our accounts of it. An announcement is meant to cause a sort of pause in the pattern, even as it persists. There is a return to the pattern. I click on an “L” in the center of the rays, and it brings me back through what has happened to the beginning, centered around a symbol for money. It is moving forward with or without me. Is this still the Diorite? As static and still as we assign? Is this the brick? Put in place where we want it? I decide to intervene. I click on the word “Diorite.” A golden thumbprint in the center of black building blocks on a white screen. It allows me to click on its center, which initiates a shift. I click on the symbol for money. A black screen with a thumbprint that builds itself out of golden letters that overlap. This is perhaps our shared identifying mark. I wait. “Bricks fell to announce that they had fallen, rather.” I wait. These chapters refer to my prior reading. They are an archive of what has been read. I click on an “O.” The screen turns black. I wait. The chapters disappear. Mark Jeffery during a performance of The Precession at the Hyde Park Arts Center in March 2011. © John Sisson Photography. Within this format of questionable divisions that overlap and shift, the book is redefined as it is translated from its traditional physical form into a conceptual entity of readable spaces in new media. Then, “chapters” become more fluid organizational units rather than static ones, and previously passive divisions are activated as performances of traditions in transition. The piece is continuous, circular, and potentially endless, a metaphor for the conversation between older and newer forms. To change the material artifact is to transform the context and circumstances for interacting with the words, which inevitably changes the meanings of the words as well. This transformation of meaning is especially potent when the words reflexively interact with the inscription technologies that produce them. An extremely current project, theprecession.org is particularly concerned with our reception of units of information in time, our apprehension of how language congregates and aggregates around us, and our specific orientation in a field of stimulus and information. After entering the website and being given a thorough orientation for our eyes to the kind of movement that will be required of them here, we might arrive at the chapter “POLI.” The play on the term POLI in this central poem reveals a fascination with the juxtaposition between larger social structures and the most basic units of life. Polis is a Greek root meaning both the city and its citizens, and poli is the human gene responsible for the production of a DNA enzyme. The title then serves as a catalyst for the understanding of the poem on both its macro and micro levels. Words and letters are scattered across the screen, making patterns that both challenge and facilitate comprehension. So, most importantly, the reader is involved in a real-time construction of meaning with fragments of language structures that appear in electronic environments. Readers must use their own sense of synthesis to create an accurate representation of the haphazard apprehension of the world. It’s important to note that an experience of poli can occur over a period of minutes, hours, days, or even months. When I first loaded it up, I had the immediate sense that the poem had its own timeframe, which I could access in a range of degrees between how I was directed into it and what my own timeframe was urging me to do. Further, the pace of the language as it appeared on the screen reminded me that all writing always exists in two sets of time: that of its own making, and that of the reader’s discovery. As digital technology allows us increasingly individualized control over our environments, our relationship to language becomes more personal as well. Surfing for the most personally relevant material, we use language to process the information that we select, and we then change ourselves in order to cope with knowledge and experience. How this process effects a particular notion of orientation in time and relative place is a central metaphor anchored by a definition of precession provided by Morrissey and Jeffery in a video documentation of rehearsals for a performance of the piece: the Earth’s axis tilts one degree every seventy-two years, roughly a lifetime. Interpreting the movements in space by Morrissey and Jeffery around projections of the poem, we may decide that we must follow what we perceive to be the center of our world as it shifts, and we are constantly reorienting ourselves as our understanding of our surroundings adapts, even if we might not notice it happening. Images from a performance of The Precession at the Hyde Park Arts Center in March 2011. © John Sisson Photography. Starting point: summer 2009. The poem seems centered on our reception of images from the media about “real” boyhood. People are tweeting about Harry Potter and there’s a lot here about Pinocchio. There’s no such thing as a real boy or a magic boy or a boy who is not real but still walking around. A little while later Tiger Woods is I guess who everyone is tweeting about. The boy seems to have grown into a man. But maybe not a real man (he is another male representation in the media). “A feather at the top of the stairs, a father.” Genealogical material determines not only gender, but changes in language. Remove a letter and you have the difference between a word and a person. A representation. “Chorus: keep misreading.” Language overlapping and the Internet’s always moving. Literary form might naturally gravitate into a design that imitates life forms. A deep pattern may now generate or dictate life. I say go further and congregate. Lay down tracks that cross and split. Enter an inner space that spirals out. Find a reflection that’s not you. Top off the afternoon with a trip to the Hoover Dam. See frozen angels perched there. Each manifestation of theprecession.org demonstrates a poetics of immediacy and direct address. On the site, programming is concerned with the ways that the population who logs on assimilates language according to its expectations of how it will appear. Performances acclimate to the expectations of a live audience and adapt the project’s core issues to engage the present tense of presence, live action of bodies, and utterance in a space. A video “documentation record” of a rehearsal of The Precession, posted on Vimeo, is edited meticulously to fit appropriately to its medium and location as a short video on a video sharing site, and quickly transcends documentation to become video art. The video shows Morrissey and Jeffery rehearsing the performance elements of the piece, and cuts produce palpable effects of active decision-making by the videomaker, another collaborator. Before it plays, the video presents itself as a screen shot of a quote by Franklin Delano Roosevelt in the project’s trademark architectural yellow font for the piece: “I hope that you will pardon me for the unusual posture of sitting down during the presentation of what I want to say, but I know that you will realize it makes it a lot easier for me in not having to carry about ten pounds of steel on the bottom of my legs.” Roosevelt’s words serve as an indirect reference to the immobilization and weight that we are all currently subjected to by the conditions of media: remember that you sit yourself down to be shackled to a metal computer or TV, and keep in mind that even as we sit to watch or listen to anything as an audience we are bound by a cultural contract that includes our momentary passivity. Roosevelt’s disclaimer suggests a premise of self-awareness that, as the video begins, immediately fractures into a kaleidoscope of lines of text and audio play bars criss-crossing a computer screen. As the camera angle widens, we see two large projection screens, each with the same image, that create an amplified fracture. As the camera begins to pan, Jeffery and Morrissey create embodied translations of the phrases in the poem. Doing so, they curiously question the meaning of the moment in a piece of art. In a live performance, this is an immediate experience, but in a poem, each line may serve as a “moment” in which the reader ciphers a bit of meaning. Using the website during the performance, they directly challenge and exercise our expectations of the physical aspects and timing that we rely on to parse information by directly juxtaposing our experiences in different modes. At first, Jeffery stands on a chair holding a mic on a stand out to Morrissey, who speaks into it obediently. However, Jeffery soon sweeps the mic out into an arc that traces the diameter of the performance space they’ve created, which forces Morrissey to follow it. In the next scene, they’ve switched places. With these simple and effective gestures, the viewer becomes a point on an analogous arc, and, when we examine our own position, we find that we are in a similar array of conditions. And what are our external signals for change? After all, about two and a half minutes into the eleven-minute video, the seminal quote appears on the screen: “Every 72 years / The Earth’s axis / tilts 1 degree / this tilting is / called precession.” We are quietly caught up as the focus of a parallax that places us in paradox: subject to the rules that gave rise to us, but with some access to the agency that our social conditions provide. [l]iterary works that strengthen, foreground, and thematize the connections between themselves as material artifacts and the imaginative realm of verbal/semiotic signifiers they instantiate open a window on the larger connections that unite literature as a verbal art to its material forms …. [T]echnotexts play a special role in transforming literary criticism into a material practice, for they make vividly clear that the issues at stake are nothing less than a full-bodied understanding of literature. Hayles, a critic who fuses the concerns of McLuhan’s media theory and Bernstein’s poetics, sets a theoretical precedent that is fulfilled by The Precession: an expansive and utterly creative project that experiments with forms, expectations, and manifestations of our relationships to action, language, writing, and art. I find the ground that is opened up for other electronic writers or performers to be extremely exciting, but what I find even more significant is the equal challenge that it holds for writers who use the page as their screen. Moves like the ones that theprecession.org makes with form and language are poetic gestures that should be especially inviting, and not intimidating, to all those who continue to work with text in space. The screen and the page are not so separated by technology that they can’t both be seen as sites related in their unique potentials for considerations of movement, experimentation with form, attention to time spent there, and meanings that emerge from play with these material conditions. 1. Judd Morrissey, “Hacking the Night Sky: A Transdisciplinary Code Poetics,” lecture at the School of the Art Institute of Chicago, April 2011. 2. Frank O’Hara, The Collected Poems (Berkeley: University of California Press, 1995), 499. 6. Marshall McLuhan, Understanding Media: The Extensions of Man (New York: McGraw-Hill 1964), viii. 8. Craig Saper, “Electronic Media Studies: From Video Art to Artificial Invention,” special issue on Deleuze and Guattari, SubStance 20, no. 3, issue 66 (1991): 114. 9. Charles Bernstein, introduction to The Politics of Poetic Form: Poetry and Public Policy, ed. Bernstein (New York: Roof Books, 1990), vii. 11. N. Katherine Hayles, Writing Machines (Cambridge: MIT Press, 2002), 23–24. 12. Hayles, Writing Machines, 25–26.